Bestiaire handily makes the argument that animals shouldn’t be housed for the viewing pleasure of humans as Côté plops his camera throughout the bestiary and watches the animals stomp, snort, and scuffle in unnatural environments. The approach of Joy of Man’s Desiring offers some of the same methodology as Bestiaire, for the fixed camera placements in various factories deliver static shots of weary animals bustling around their metal cages. If Bestiaire is an astute observation of the relationship between man and beast, then Joy is a provocative essay on the connection between man and machine. 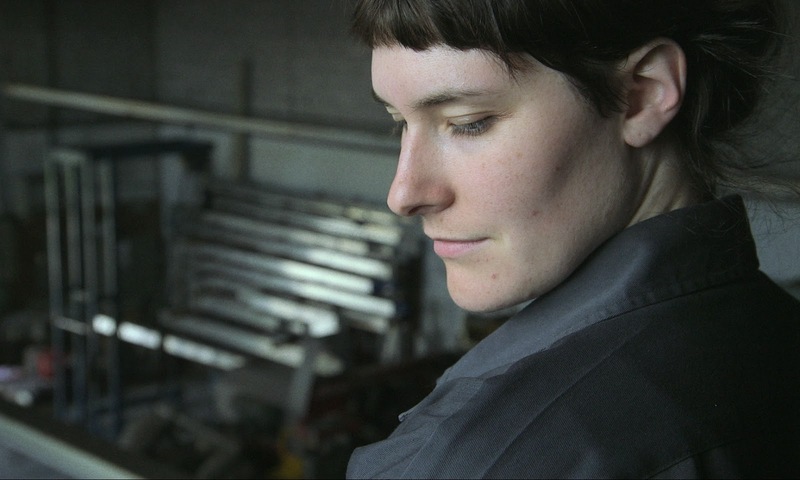 Joy of Man’s Desiring opens with a poetic prologue featuring a female factory worker before it moves to a wordless forty-five minute opening act. The woman, candid yet anonymous in the sterile setting, playfully address the camera in an elusive monologue in which she directs her gaze outside the frame and her words at an absent recipient—a colleague, friend, and/or lover. She speaks of reciprocal relationships and she hints at hopes and dreams in flowery, ethereal language. The woman, a muse of sorts, then takes an abrupt tonal shift and emphatically declares that she is not a machine. She may not simply be switched on and off. Joy of Man’s Desiring, however, then defies the woman and does just that. The near clinical cadence of the film observes various nameless workers fulfilling mundane tasks in anonymous factories. Côté’s open-ended essay presents the workers not as humans, but as drones. The workers say nothing and do nothing as Côté alternatively glimpses into the various workplaces in which man and machine are almost indistinguishable. The film offers shots of one man as he feeds metallic strips into a machine and punches one end, turns it around, and punches the other as if he operates on the same circuit as the machine itself. Another man wraps a skid of boxes in plastic. He revolves around the stack of cardboard cubes like part of a spindle as he completes the tasks at a hypnotically mundane pace. A group of workers cleaning and folding laundry are matched with shots of their industrial counterparts fulfilling the same task. Alternatively, Joy of Man’s Desiring offers one striking shot in which two women have a chat while they sort the linen. The extraordinary sound design of the film, however, drowns out their words with the hum of the machines. The process mechanizes the workers. It turns them into extensions of their machines. There is something symphonic, though, to the rhythm of the piece. The austere cinematography by Jessica Lee Gangé captures the coldness of the industrial settings, but it also brings them to life. Static shots isolate and fragment bits of the machinery to show how each piece plays a part in the greater process. A striking shot of a trio of air filters, for example, sees each of the three take a turn puffing dusty air. Each burst offers a note within a bigger harmony. If the first movement of Joy of Man’s Desiring is symphonic, then the latter half is decidedly dramatic. Côté breaks with the non-fiction element of the documentary and observes the workers with an absurdly entertaining cinema verité style. The workers in these scenes are wholly humanized. Their actions, such as a woman cleaning layers of dirt off a sign that says “L’eau potable” (“Drinking water”), reiterate the inhospitableness of the environment and the difference between machines and people. The people in these scenes have words, thoughts, and ideas. They voice feelings of boredom and disappointment. The film, for example, reintroduces the woman from the opening prologue and watches her discuss her fatigue of the job with a colleague. “Nobody dreams of working the same machine for ten years,” she says. Joy of Man’s Desiring, however, maintains the matter-of-factness and objectivity of its observation as the interactions of the workers demonstrate the necessity of assembly line labour as a means for survival. A young woman tells the muse how she desperately needs a job so that she may feed her children, while the muse’s aforementioned colleague regales the factory workers with a fable on the legacy of manual labour. Joy of Man’s Desiring never brings the camera to look within the offices of the people who run these factories, nor does it ever show the workers tangled in workplace accidents. The film instead underscores the conviviality between the workers to accentuate a whir of life within the industrial setting. Joy of Man’s Desiring might be a film of repetition and periodic monotony, but Côté’s approach ultimately ends with the sense of a job well done. The fact of the matter is that one must work to live, and Joy of Man’s Desiring captures the inevitable glimmer of humanity that beats within the machine. It might be Côté’s strongest film yet.